After consumption, human and veterinary drugs or their breakdown products end up in streams and rivers via wastewater effluent discharges into water bodies. Since this is a continuous process, aquatic animals are chronically (low concentration, long-term) being exposed to the residual pharmaceuticals. Although this has been occurring for several decades, a recent advance in improved analytical detection has focused attention on the low level exposure of drugs to non-target animals. Drugs are specifically designed to interact with certain biological targets (enzymes and receptors) to produce desirable pharmacological effect in mammals. Since a number of these drug targets are also present in lower vertebrates, low level aquatic exposure to drugs or related products may trigger similar or unanticipated pharmacological responses in these organisms. Since many fish are relatively high in the aquatic food chain, they are at elevated risk of exposure to pharmaceuticals which have bioconcentrated in their food items. This unintended exposure, therefore, may result in sub-lethal (e.g. developmental, neurological, endocrine, immunological and reproductive) effects in fish living in proximity to wastewater discharges. Since hundreds of pharmaceutical products are in use globally, it is not practical to evaluate each of them for their potential toxic effects on fish and hence prioritization is key. One such approach is the utilization of available mammalian drug safety information, specifically, plasma concentration of drugs in humans, clinically referred to as maximum plasma concentration (Cmax). The Cmax data on drugs are available in public domain (for e.g. www.rxlist.com). In what is referred to as ‘Fish Plasma Model’ to predict risk potential to fish, measured or predicted fish plasma concentrations are compared to human plasma concentrations. The ratio of the two plasma concentrations (human/fish) called ‘effect ratio (ER)’ could be used to predict aquatic risk potential. If the fish plasma levels exceed that of human (i.e. ER less than 1), potential risk to fish is expected. In our study, plasma concentrations of four commonly used drugs: norethindrone (oral contraceptive), ibuprofen (pain killer), verapamil (anti-hypertensive) and clozapine (antipsychotic) were measured in channel catfish. 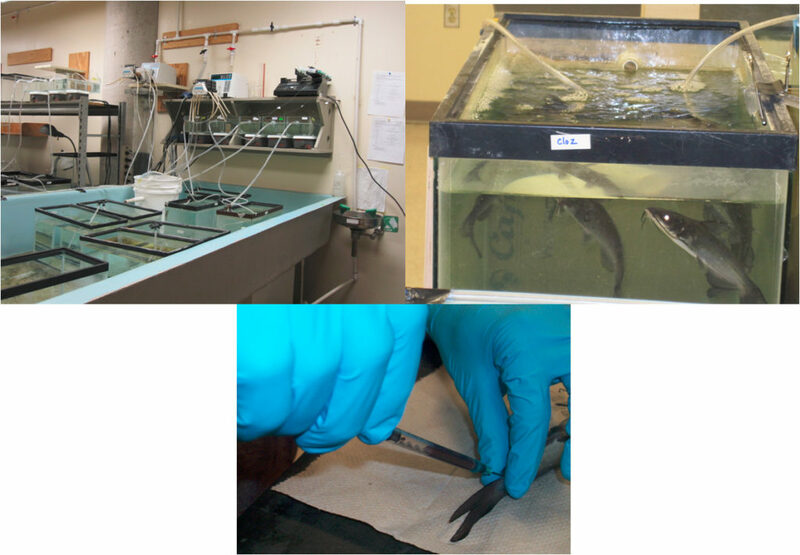 Briefly, in separate laboratory experiments, fish were exposed to each test chemical in tanks designed to have continuous flow-through system. At the end of the defined exposure phase, typically 7 days, fish were sacrificed to collect blood. Plasma was separated and analyzed for the concentration of the four drugs. The measured plasma concentrations were then compared to the Cmax values to calculate ER. The results indicate that ER values of three drugs: norethindrone, clozapine and verapamil are well below or equal to 1. In other words, fish plasma levels of these drugs exceed or approach human plasma concentrations, implying that the three products need to be prioritized for further testing. On the other hand, fish plasma levels of ibuprofen are well below the corresponding Cmax, indicating relatively lower risk to fish. In summary, testing of hundreds of pharmaceuticals for their possible unintended effects on non-target aquatic animals is not feasible due to the enormous resources required, including animal usage. Since all pharmaceutical products go through extensive human safety evaluations, utilization of such existing information helps prioritize drugs for further testing. This paper highlights the value of the ‘Fish Plasma Model’ in which the ratio of plasma concentrations in human and fish is used to predict the aquatic risk potential. Comparison of Measured and Predicted Bioconcentration Estimates of Pharmaceuticals in Fish Plasma and Prediction of Chronic Risk. Nallani G, Venables B, Constantine L, Huggett D.